HÀ NỘI — Cao Phong oranges, a special fruit from the northern mountainous province of Hòa Bình, will be dessert for business class passengers on nearly 70 routes of Vietnam Airlines from Hà Nội and HCM City to Asia, Europe and Australia, and on the domestic flights between the two major cities. The fruit will be served from December 8-22. 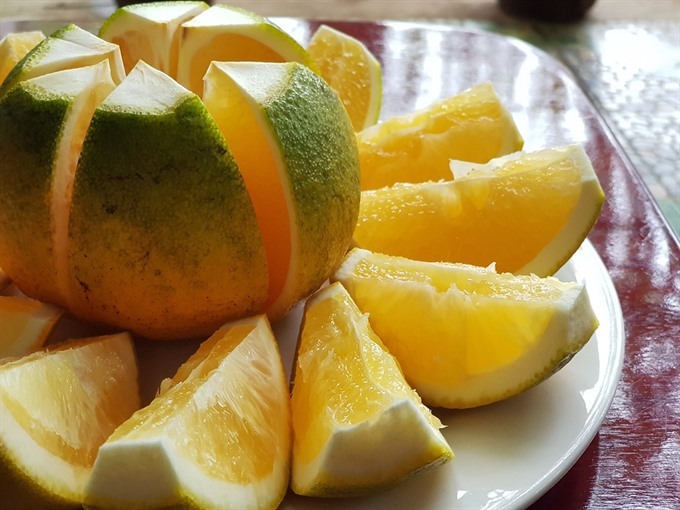 With the aim of spreading traditional products, after Lục Ngạn lychee and Hưng Yên longan, Cao Phong oranges are the third fruit selected by the airline to be served to business class passengers. To ensure product quality, Vietnam Airlines applies a strict selection, inspection and supervision process from harvesting to serving. From the areas that meet the VietGAP standards, the fruit will be harvested and transferred to a cold storage unit kept at five to seven degrees Celsius after they are disinfected. Cao Phong oranges are grown on fast draining hills in combination with red basalt soil, making the trees healthy and the fruit sweet. Lê Hồng Hà, Deputy Director General of Vietnam Airlines, said food on the flight was one of the first cultural touches for tourists, especially international tourists.